In order to reduce the production cost, cassava pulp has been incorporated in chicken diets as an energy source. However, the use of such agro-industrial by-product may be confined by its higher fibre and lower protein contents. Improving the nutritional characteristics (lowering fibre and increasing protein content) through fungal solid state fermentation may be conducted to increase the inclusion level of cassava pulp in chicken rations. 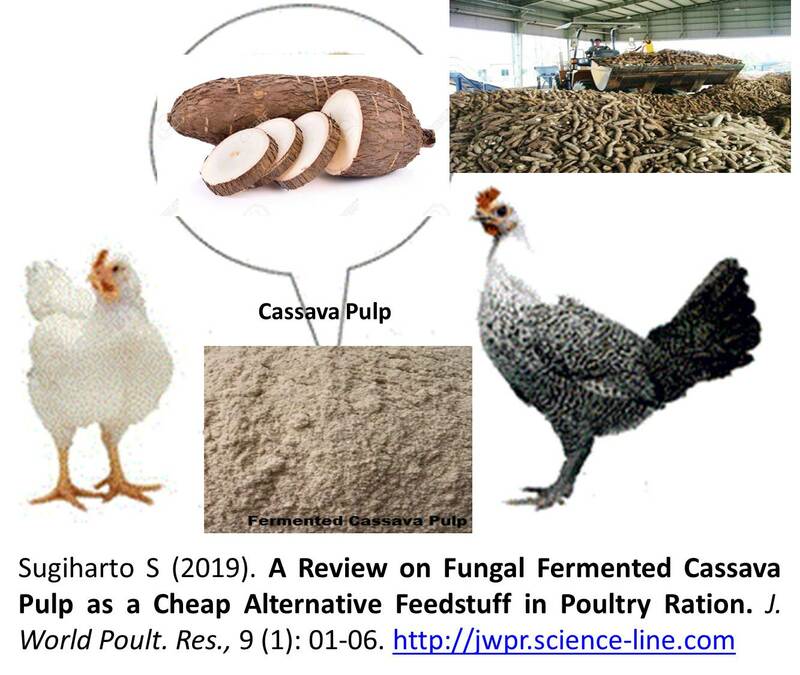 Apart from an energy source, fungal fermented cassava pulp (FCP) may also exert a beneficial effect on intestinal health of chickens, although further studies are needed to explore the functional benefit of FCP on chicken health. 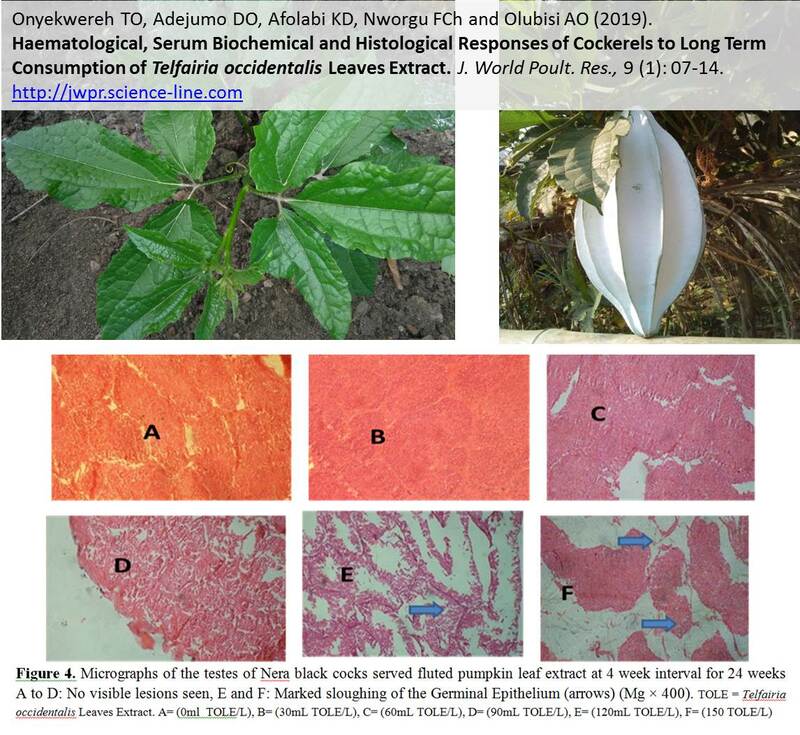 Haematological, serum biochemical and haematological histological responses were studied in cockerels undergoing a long-term supplementation with Telfairia occidentalis Leave Extract (TOLE). Haematological and serum biochemical parameters investigated included haemoblobin, white blood cells, red blood cells, lymphocytes, heterophils, monocytes, eosinophils, total protein, aspartate aminotransferase, aspartate amino transferase and triglyceride. Histological changes associated with Telfairia occidentalis leaves extract on the kidney, liver, spleen and testes were also examined. Result showed that birds on TOLE has higher values for most of the haematological parameters studied which were significantly (P < 0.05) higher than the control. Also the total protein, globulin and alanine aminotransferase were significant (P < 0.05) for birds on TOLE having higher values while for triglycerides birds on the control treatment had the higher values which was significant. There were no significant changes in the albumin and aspayrtate aminotransferase. Histological changes showed mild to severe congestion in the spleen and testes of birds that received 120 and 150mL TOLE/L of water that also showed reduced germinal epithelium height and sloughing of the germinal epithelium respectively. 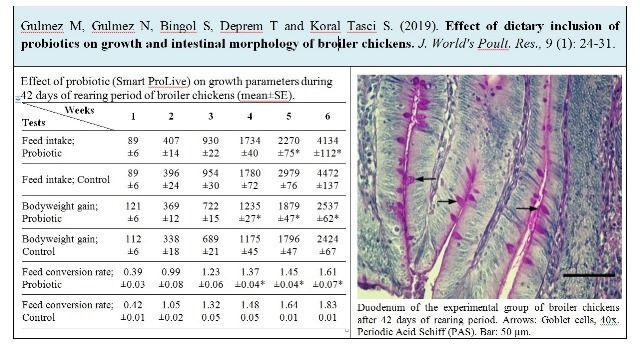 Long term supplementation of TOLE for cockerel production should not exceed 60mL of TOLE per liter of water as the administration in excess of this can bring about tissue breakdown and reduced fertility. Animals suffering from blood loss can benefit from the administration of fluted pumpkin leaves extract as the extract increased erythron production. Poultry meat is very popular in Ireland because of low cholesterol level. Ireland is in the top position for the consumption of poultry meat in whole Europe. 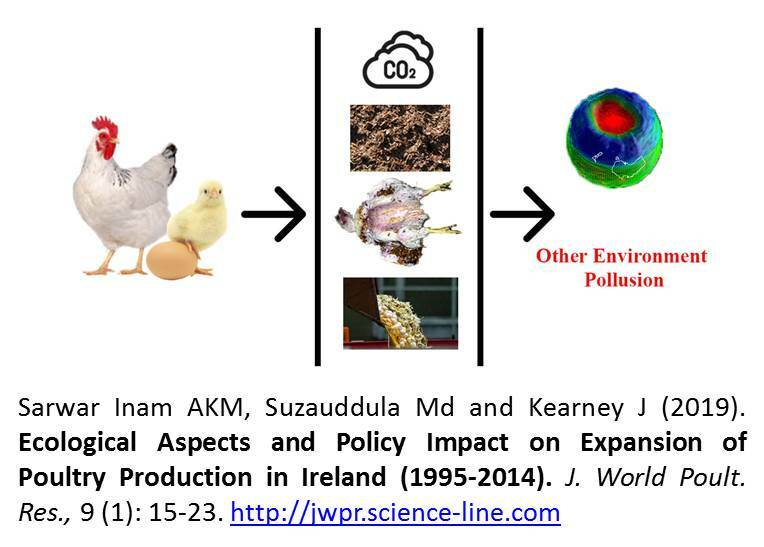 Ireland emits 3.3 kg CO2- equivalent per kg of poultry for the poultry meat production which is the lowest amount among all the other European countries. To expand this sector with respect to environmental concern some issues need to be considered very carefully such as effective poultry feed production system, energy consumption in both poultry production and processing area, manure management system, wastewater and odour management systems. If these issues are not handled carefully, several types of harmful effect will occur in both living and environment cycle such as water borne diseases, global warming and ozone layer depletion. The objective of this report is to give an overview of the current situation of poultry production in Ireland, policies and legislation related to poultry production and to show the way to expand this sector in Ireland in line with current ecological concern. Probiotics are currently under investing the most valuable substances alternative to antibiotic growth promoters in poultry breeding practice. This research was performed to evaluate the effect of supplementing broiler drinking water with probiotics (Pediococcus acidilactici and Bacillus subtilis) at a concentration of ≥108 CFU/ml during 42 days of feeding period on growth performance and gut health. A total of 144 one-day-old Ross 308 broiler chicks (mixed gender) with an average initial BW of 42.3 g were used. The chicks were allotted to pens with 12 birds per pen and six replications per treatment with food and water provided ad libitum. Feed intake of Probiotic group was 4134 g, 338 g less than that of control group. Live weight of probiotic group was 2537 g and a 113 g more than that of control group. The feed conversion ratio of probiotic group was 1.61, 0.22 less than that of control group. The crypt depth of probiotic group (1110.46 ± 224.016 µm) was statistically deeper than that of control group (949.39 ± 114.166 µm) in ileum. Continuously use of probiotics in drinking water of commercial poultry flocks appears to be alternative to AGPs. The results of this study provide a greater understanding of the impact of long-life use of probiotics on broiler health and growth performances.